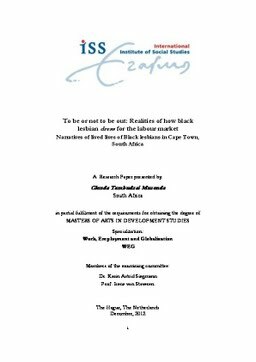 This paper focuses on the experiences of lived lives of black lesbians in the South African labour market. It shows how in a heteronormative space they manage and perform their sexualities due to discrimination that exists from organizational culture that limit access for lesbians. Discrimination on the basis of sexual orientations is underreported particularly in the context of employment in South Africa; this study reveals the existence further marginalization on basis of being black, a woman and a lesbian which is supported by investigations into daily lives of respondents in the work place-how they manage and cope discursively, actively and make decision about their identities.